Monet’s Les Peupliers set to sell for $25 Million! Les Peupliers was actually bought in 2000 for just over $7 Million, 11 years later it’s expected to sell for $25 Million, that’s quite a good return on your investment! 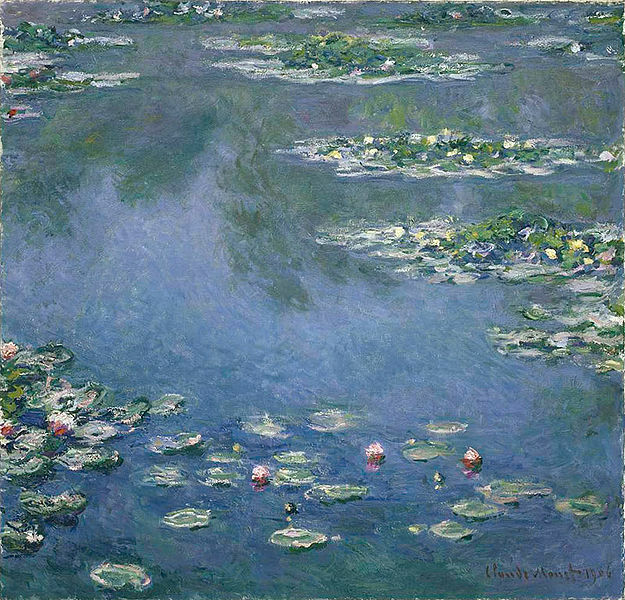 The auction record for a Monet was $80.4 Million for Le Bassin aux Nympheas, which was sold in May 2008. Monet’s Les Peupliers actually sold for £13,489,500 Million ($22,482,500) on the 4th May, 2011 to a private American collector. If you too, are interested in acquiring Monet paintings but don’t have the Millions needed to buy an original, you can always purchase a fine art reproduction oil painting of any of his paintings through Fabulous Masterpieces. We’ve hand-painted a lot of Monet paintings over the years, if you would like to see some of our examples, please do email us and let us know. We’d love to hear from you! If you would like to add something, or ask a question concerning our art reproductions please leave a comment. To view the Monet online art gallery please click here – Monet’s Online Art Gallery. Having just come back from Giverny, I thought I’d have to include a post on Monet having seen his wonderful gardens and house. Monet’s & Renoir’s paintings of La Grenouillere really interest me as we’ve done art reproductions of both and they’re surprisingly different. Surprising, as they painted their paintings at the same time on the same day whilst they were together one Sunday. La Grenouillere actually means ‘the frog pond’ and was a popular spot for young Parisians to dance and go for a swim. The round floating dock in the centre of both paintings was called ‘le camembert’ because it reminded them of the French cheese. As you can see from looking at the two paintings even though Monet and Renoir have painted the same scene, they are remarkably different. For instance, Monet has captured two ladies in long swimming costumes, which you can’t see in Renoir’s painting. Whilst, if you look carefully at Renoir’s La Grenouillere, he amongst other things has managed to paint 2 dogs and a sail boat, which is not seen in Monet’s. Fabulous Masterpieces has painted a lot of art reproductions of La Grenouillere over the years, below is an example of our Renoir La Grenouillere hand-painted in oils onto canvas. If you would like to purchase La Grenouillere by Renoir or Monet’s version please contact us or visit either the Monet online gallery or Renoir art reproduction page. If you would like to know more about art reproduction, what it is, who buys them etc, visit our art reproduction question page, here. A few days ago my husband and I went to Christie’s London for their sale preview where you’re able to view some seriously impressive artwork that has now gone under the hammer. I highly recommend going to these preview days at Sotheby’s and Christie’s. It’s incredible seeing a plethora of paintings, a vast amount that you’ve never seen before due to them being in the vaults and houses of private collectors. We walked passed Signac’s, Schiele’s and Klimt’s before standing opposite the monumental Nympheas, painted in 1906 by Claude Monet. I say monumental as it’s not a small painting, it measures 90cm x 100cm. While Nympheas is a lovely calming painting, that was painted in Monet’s water garden in Giverny and is also one of five paintings, which formed part of his celebrated display of Water Lilies at a 1909 exhibition in Paris, the most impressive thing about Monet’s Nympheas painting is that it was valued between 30 – 40 Million pounds! Wow. After such high expectations and buzz from the press, Nympheas (1906) failed to sell. Bidding reached 29 Million pounds. If you however, enjoy Monet and would love to have a reproduction oil painting of any Monet painting, please have a look at the online Monet gallery. For me however, I also found 3 paintings that I really loved whilst at Christie’s. 2 paintings by an artist, I hadn’t even heard of called Henri Lebasque , which I’ve decided to commission reproduction oil paintings of for the living room. Will post pictures when they’re done.